A recent report published by Infinium Global Research on medical aesthetics market provides in depth analysis of segments and sub-segments in global as well as regional medical aesthetics market. The study also highlights the impact of drivers, restraints and macro indicators on the global and regional medical aesthetics market over the short term as well as long term. The report is a comprehensive presentation of trends, forecast and dollar values of global medical aesthetics market. According to report the global medical aesthetics market is projected to grow at a CAGR of 10.50% over the forecast period of 2018-2024. The medical aesthetic is the broad term used for advanced skin care treatment. It typically includes several advance skin care treatment such as advanced facials, chemical peels, microdermabrasion. It involves high technology skincare services that exhibit the fusion of healthcare and beauty services. It is the application of modern health & skin care technologies that bring significant cosmetic change to the consumer. Its service may include the application of energy-based equipment for better performance. Additionally, it includes several laser treatments such as laser hair removal, skin rejuvenation, and minor vascular treatments. The growing old age population, facial deformation due to accidents, growing self-desire among the young and aspiring population to groom their physical appearance are the major factors for the growth of this market. Additionally, growing pollution is hampering the physical appearance of the human. It is boosting the demand for medical aesthetics products and service for the long term. The medical aesthetics market is growing rapidly. There is an old proverb that face is the index of the mind. Today, in this commercial environment, looks are one of the important factors for the growth in the carrier. It helps to boost the confidence of the person. Nowadays, male and female both are more conscious of their facial look. They are expending a large chunk of their disposable income in the aesthetic product to keep their facial image intact for the long term. The millennial consumers are more concerned about their look. Additionally, the growing influence of print and electronic media is motivating the potential consumers to try different aesthetic products. North America is the largest market of the Medical aesthetic market. North America has the largest market share owing to the intensive presence of big and branded companies in this area. Additionally, people in this region are more concerned about their physical presence. They spend more on the maintenance of the physical look. Asia-pacific is the highest CAGR growing market in the world. The Asia-pacific market is growing at the highest CAGR due to a large number of the young consumer base, increasing disposable income among middle and young consumer. Additionally, an inflow of several medical aesthetic services and product companies in this region is helping to provide the desired product and service at the proximity of the consumer's area. This trend is helping to grow the market in the Asia- Pacific region. The report on global medical aesthetics market covers product segments. On the basis of product the global medical aesthetics market is categorized into facial aesthetics, dental implants, laser-based medical aesthetics and breast implants. The report provides profiles of the companies in the global medical aesthetics market such as, Ellman International, 3M Healthcare, Cynosure, Bioha Laboratories, Allergan, Merz Aestehtics, GROUPE SEBBIN, Nobel Biocare, Straumann and Establishment Labs. The report provides deep insights on demand forecasts, market trends and micro and macro indicators. 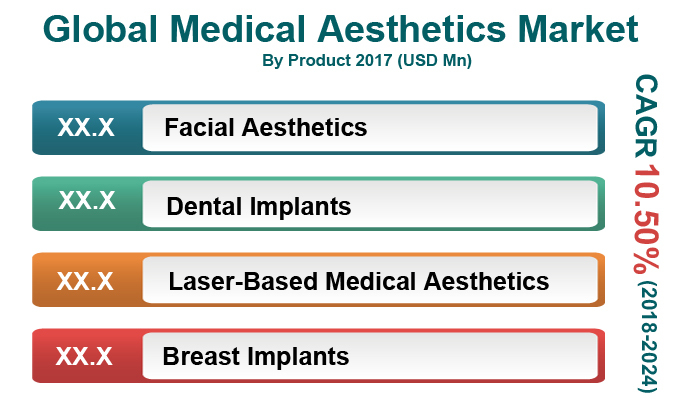 In addition, this report provides insights on the factors that are driving and restraining the global medical aesthetics market. Moreover, IGR-Growth Matrix analysis given in the report brings an insight on the investment areas that existing or new market players can consider. The report provides insights into the market using analytical tools such as Porter's five forces analysis and DRO analysis of medical aesthetics market. Moreover, the study highlights current market trends and provides forecast from 2018-2024. We also have highlighted future trends in the medical aesthetics market that will impact the demand during the forecast period. Moreover, the competitive analysis given in each regional market brings an insight on the market share of the leading players. This report will help manufacturers, suppliers and distributors of the medical aesthetics market to understand the present and future trends in this market and formulate their strategies accordingly.